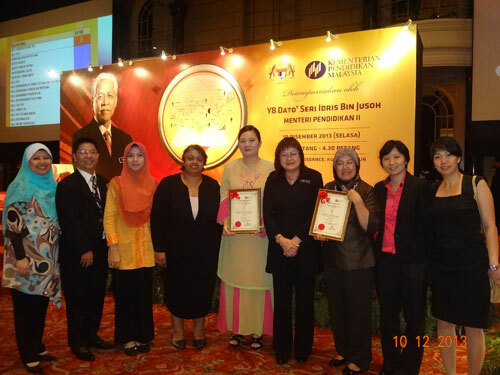 Tan Ling Ling (fifth from left) with Yang Berhormat Datuk Mary Yap Kain Ching, Deputy Minister of Education I, Ministry of Education Malaysia and the team from INTI International College Subang during the awards presentation. The 6 star cluster-based award for general programme recognizes INTI International College Subang’s outstanding efforts in delivering quality Pre-University pathways. This includes the American University Program, which has seen the progression and transfer of thousands of young INTI graduates to leading American universities. The second award is for INTI International College Subang’s excellence in services, particularly for its Hospitality programmes which are in collaboration with leading hospitality institutions in Australia and the United States – the Blue Mountains International Hotel Management School and Kendall College School of Culinary Arts. “This has been an exciting journey for us and we are very pleased with this recognition that will spur us to strive harder. We want to lead in academic innovation and raise the bar in education excellence through our unique approach to learning that empowers each student. We will continuously set new benchmarks in our efforts to ensure strong graduate outcomes,” stressed Tan Ling Ling, Chief Executive of INTI International College Subang. MyQuest evaluations are carried out every two years to measure the strengths and performance of participating private colleges in Malaysia based on several categories. This year, over 200 private colleges in Malaysia were shortlisted and ranked in three main categories – college-based, cluster-based and international student readiness. The 6 star rating is given to institutions with outstanding performance in each category and INTI International College Subang bagged the coveted 6 star rating in two award categories. This milestone achievement will further enhance INTI’s mission to be the most international, innovative and individualized education provider. With an aim to champion change by reinventing the parameters of education in building dynamic leaders for the future, INTI hopes that its various initiatives in collaboration with leading industry and academic partners will meet the needs of today’s employers and graduates.